Before you skip this recipe because you THINK you hate scones, give this one a try. These tasty Cranberry Chocolate Rosemary Scones are deliciously moist in the best way possible, unlike the dry, crumbled up scones you are used to eating! a small unsweetened or lightly sweetened biscuit like cake made from flour, fat, and milk and sometimes having added fruit. Let’s get started with what the true definition of a scone is. Something similar to a biscuit, but not a biscuit. Normally, they’re dry and not delicious, quite the opposite of this recipe for my Cranberry Chocolate Rosemary Scones. I’m not kidding when I tell you that I ate four scones in a day before I realized I needed to get the rest out of my sight unless I wanted to gain ten pounds in a day! They are THAT good, due to the liquid to dry ingredient ratio, as well as the cranberries that pop in your mouth in every bite. 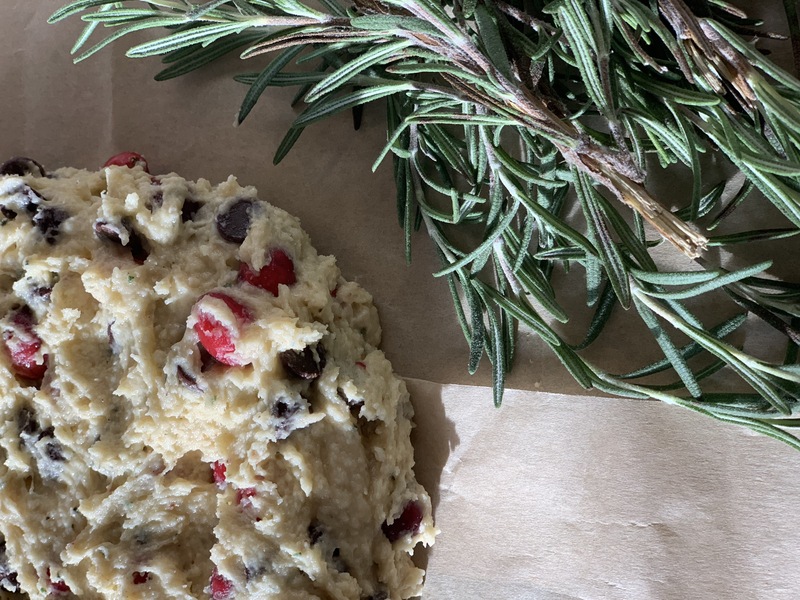 The combination of tart cranberries, gooey chocolate chips, and herbaceous fresh rosemary might sound odd but I promise you it’s addictive in a sweet/savory way that you’ll love! Cranberry Chocolate Rosemary Scones will become your favorite quick treat to bake during the weekends! Work in the cubed butter with your fingers until pea-sized. Do not overwork the dough. Whisk the egg, milk, and vanilla together. Drizzle into butter/flour mixture and stir until just incorporated. Fold in the cranberries, chocolate, and rosemary with hands. Place dough in the center of baking sheet, forming a circle that's at least 1.5 inch to 2 inches high. Bake immediately or refrigerate and bake the next day - either works. To bake: bake for 20 minutes, remove from oven and slice into six wedges. Finish baking at 400F for 5-10 more minutes. Great recipe. So easy to make and great flavors. Made it straight away. The rosemary with the chocolate and cranberry blends so well.